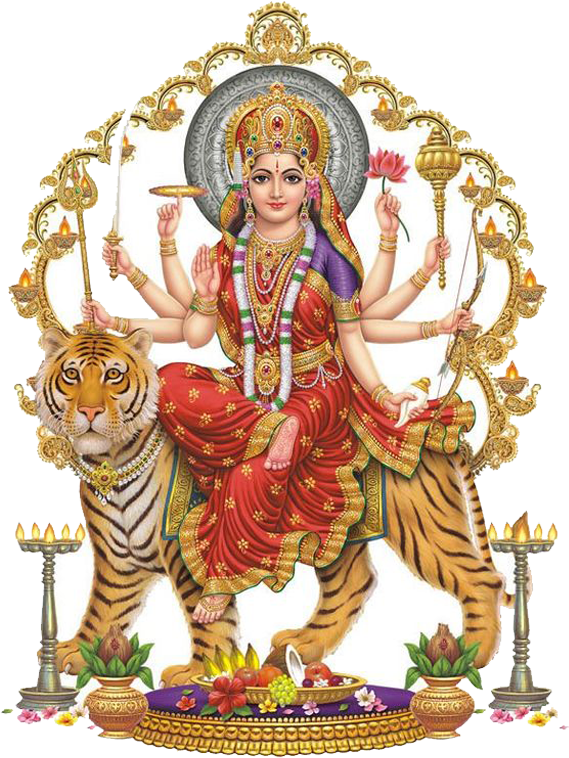 Navratri is the celebration of the Nine Forms of Goddess Durga. The essence of the divine feminine in the Hindu Pantheon is described as Shakti, and Shakti in manifestation to support, protect, and love her devotees appears primarily as Durga. Goddess Durga, identified as the Warrior Goddess and protective Mother Goddess, is the principle and popular form of Shakti. Her mythology surrounds combating evil demons that threaten peace, prosperity, and the overall good. She appears as the fierce one to liberate all from violence and empower creation. Qoya founder Rochelle Schieck joins Radzy Chugh, an inspiring soul and Qoya teacher in India, to share the origin stories of these goddesses with an invitation for how we can embody their energy each day. We live in a transformational time when the rise of the feminine is being called for in each woman, each person, each organization, each business, and each community for the benefit of all beings and the world we live in. While stories and narratives of the fierce and protective feminine aspect of the divine have been erased from many cultures, the Hindu traditions in India have remained and offer us an opportunity to offer devotion to these deities for their support in activating feminine energies inside of ourselves. We believe that it is through us, through our words, actions and love that we make the divine energy we pray to more visible in this world. We invite you to join us on this 9 day Navatri celebration of the Goddess. She is the first incarnation/aspect of the Goddess that we honor. Goddess Shailputri is another name for Goddess Parvati, and her name means "Daughter of the Mountain." She embodies strength, courage, devotion, and surrender to the divine path. The color for today is blue, and the offering is ghee. To embody your own strength, courage and devotion, dance with our free Qoya Movement Ritual video titled You are More Powerful than You Know. Honored on the second day of the Navratri, this Goddess embodies the aspect of complete surrender and renunciation of all worldly objects and materials in her devotion towards Lord Shiva, who embodies the divine masculine. Their union (Shiva-Shakti) is the most revered union in Hindu mythology, seen as two halves of the whole. She embodies the essence of "Bhakti" towards Lord Shiva for her desire in this union. The color for today is yellow, and the offering is water chestnut. To embody your own surrender and devotion, dance with our free Qoya Movement Ritual video titled The Subtlety of Surrender. Revered on the third day of the Navratri, this Goddess adorns a half moon in the shape of a bell, and her power stems from sound. It is said that between the battle of gods and demons, this Goddess sounded her bell and sent many demons to their deaths. Her fearlessness and fierce power evoke much admiration in her devotees. The color for today is green, and the offering is sago or tapioca. To embody your own fearlessness and fierce power, dance with our free Qoya Movement Ritual video titled It's Time to Rise. This aspect of the Goddess is revered as beams of light, and her radiance and glow inspires this name. According to legend, she lived inside the sun and gave light to the whole universe. She can be seen as the embodiment of inner light, strength and power. The color for today is grey, and the food offering is fried pancakes dipped in sugar syrup (an Indian delicacy known as Malpua). To embody your own radiance, dance with our free Qoya Movement Ritual video titled Let Your Lovelight Shine. This form of the Goddess is honored as the mother. Her name derives from Mother of Skanda (her son with Lord Shiva, also known as Kartikeya who is the brother to Lord Ganesha). She’s revered as the nurturer, provider, and life giver, and she is warm, gentle, kind, and embodies all qualities of a mother. The color for today is orange, and the food offering is bananas. To embody your own nourishing qualities, dance with our free Qoya Movement Ritual Video titled Worthy of Nourishment. This aspect of the Goddess is a fierce force to reckon with. She was born as the Warrior Goddess to Sage Katyayan, and with her birth, she came to destroy one of Hindu mythology's biggest demons named Mahishasura. After the Goddess killed him, she received the second name of Mahishasuramardini (Destroyer of Mahishasura). She is revered for her innate strength, immense power, and fierceness. The color for today is white, and our food offering is honey. To embody your own immense power, dance with our free Qoya Movement Ritual video titled Let's Go Be Who We Are. On the seventh day of this festival, the Goddess is revered as the ruler of of time and slayer of darkness. With her blessings, you can free yourself from the limitation of time and the prison of fear. Her untamed and ferocious power aids in illuminating the consciousness and rids devotees of worry, fear, and sorrow. The color for today is red, and the food offering is jaggery (brown sugar). To embody your slayer of darkness, dance with our free Qoya Movement Ritual video titled Be The Light or the Wisdom to Dance With Your Shadow, depending on which resonates more for you today. On this day, the Goddess is revered as the shining, radiant, and beautiful aspect of the divine feminine. According to legend, to attain Lord Shiva as her divine companion, the Goddess forgoes all comforts, even food, and braves heat, cold, rain, and storm for many years. Her body is covered with soil, dirt, insects, and dry leaves, and her extreme penance and devotion leads Lord Shiva to accept their divine union. When he pours water on her, the Goddess emerges as Mahagauri, as white as a jasmine flower and clothed in white. The Goddess embodies her true essence: purity and divinity in surrendering all for her greater path and true desire. The color for today is sky blue, and the food offering is coconut. To embody your own purity, dance with our free Qoya Movement Ritual video titled Clarity and Purity. On the ninth and final day of this festival, the Goddess is revered as Siddhidatri. This form of the Goddess blesses her devotees with everything for a prosperous and happy life. In this form, the Goddess promises all her devotees the gift of her continued presence and blessings on their path. When living for the greater truth and path of divine purpose, the Goddess comes forth to pour blessings that help you achieve greater things in life. The color for today is pink, and we make a traditional food offering of sesame seeds. To embody your purpose, dance with our free Qoya Movement Ritual video titled Commit to Your Future. Embody the Goddess with Rochelle and Radzy at the next Qoya India Retreat on October 13 - 22, 2019!